The Wirtgen Group, now part of the John Deere Group, is one of the strongest players globally – and a preferred choice in India – in road making machinery. And, the government’s decision to up the ante couldn’t have come at a better time for the company, which is working towards being the ‘go to’ manufacturer in the road making equipment market in the country. 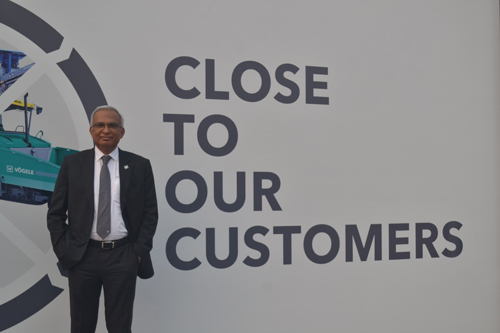 Ramesh Palagiri, MD & CEO, Wirtgen India Pvt. Ltd. speaks to Shashidhar V about how they would shape up going ahead. Now that you are a part of the John Deere Group, how would you leverage their basket of offerings in the Indian market? See, the acquisition got finalised on December 1st . So, we are now part of the John Deere Construction and Forestry division. Wirtgen Group will operate as an entity which is part of John Deere Construction and Forestry division. But, the Wirtgen brand, the products of the Wirtgen group, the people of the Wirtgen group, worldwide, will see no change. Most of the product line of John Deere Construction and Wirtgen Group complement each other. There isn’t a single product which both of us make. It is all complementary. And, then, John Deere is active in North America, Latin America, whereas Wirtgen is much more global. And, at some stage, John Deere will leverage the Wirtgen Group global presence to bring in their products. At this stage, it is too early to comment on that. It has been some time since you acquired Bennihoven. It has only been two years since we acquired Bennihoven. That is a long time in this industry, isn’t it? Yes, but if you see the companies that we acquired – Vogele, Hamm – when these companies were very small players. 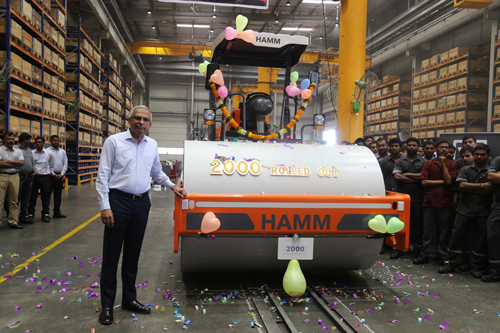 When we acquired Hamm 20 years back, Hamm was producing 900 rollers. And, they were eighth in the world ranking. But, today, Hamm is world No. 1. They produce more than 10,000 rollers. And, in a product category like Rollers, which is one of the most competitive of our products. So, everything takes time. We need to launch the product at the right time, in the right market, and when we launch, we would like to attain the leadership position. We have demonstrated it with both, Vogele and Hamm. So, similarly, with Bennihoven, which is a more sophisticated product. We are building a new factory in Germany for Bennihoven, investing almost Euro 130-mn. And, that plant will be ready in 2018. I think our current focus in India is on Kleemann. We would like to stabilise this product; we would like to get more knowledge on this product and make sure that it will grow. Coming to the Indian scenario, most projects announced of late are in the road segment. In such a scenario, how can the construction equipment industry as a whole realise its full potential? See, it is not just road projects that have been announced. I think that railway projects are much bigger. There is equal amount of investment that is going into railway infrastructure upgradation. So, how are you leveraging the opportunities in the railway industry? Railways, for us, provide an opportunity in terms of our crushing...the Kleemann range of products. Real estate and mining seem to be lagging behind, if one were to look at analysts reports. We are not connected with the real estate market in terms of our product offerings, but, yes, if one were to see, the real estate market is down. Mining, on the other hand, is stable. Mining impacts us because of our crushing and mining equipment and a little bit in surface mining. When the government announced the NHDICL, there was quite a bit of enthusiasm amongst equipment manufacturers considering also that the market was down and here was one opportunity for manufacturers. But, nothing much seems to have happened thereafter. Now, the government has again announced the Bharatmala, Sagarmala, etc. Do you think that there will be misplaced enthusiasm amongst manufacturers again, with their hopes of high sales of equipment, or am I reading it all wrong? I think that the North East development projects are going steady. I don’t think that any of us in the industry feel that there would be any change in that project simply because of the terrain, and also because of the climate. One can only work for six months in a year in those projects. And, then, you have the land acquisition. Considering all these, I think there has been good progress on the project. Now, coming to Bharatmala and other major projects which have been announced by the government, I think all of these projects are at a very initial stage. Bidding has to take place, and then the land acquisition, and then the construction. So, I expect the ground work on these projects where our machines will get deployed to happen only in the coming year. But, as I said, there are several projects which have already been awarded, and where the contractors can get going. Those projects itself will keep us busy for the coming year. What, according to you, will be the disruptions in the construction equipment industry going ahead? If you see, most projects are currently going ahead with the EPC mode. The government is funding the projects and pay on hybrid. But, for this programme to really multiply, which is what is required, I think PPP model has to be revived. Unless that happens, we will never see the multiplier effect. And, for that, the challenges the government is addressing is, one, the NPAs that the banks are saddled with. At the end of the day, it is the banks which have to finance these projects. Then, I think, land acquisition will continue to be a challenge. It is much better than the earlier days. I would say land acquisition and long-term funding for infrastructure projects at attractive interest rates will be the challenges. One big idea that most companies at EXCON are talking about is Telematics. It has been around for quite some time now, and I am sure that you too must be using such technologies in your equipment. My question is, how are you using the data mined by such technologies to build better machines for your customers? We, as Wirtgen Group, are quite ahead on telematics on the road making equipment. And, if you see, some of the equipment which is already on offer here, like the Road Scan, is something that is connected with Telematics, because we are on a live mode in terms of what is the temperature of the asphalt that is being laid, behind the paver, both the asphalt plant operator and the paver operator know and they can take instantaneous corrective action. So, similarly, in each of our product lines, we have these technologies available. We are seeing what is relevant for India, because it has to be relevant for the users here. At the right time, we will offer the right technology. In fact, we, being part of the John Deere Group now...John Deere is also way ahead on telematics. In fact, they are one of the pioneers of telematics. So, we will certainly leverage all the strengths to offer what is relevant for our customers here in India. Do you think that e-commerce can come into the construction equipment business? I think, may be for some of our products it may come. Not immediately, though. Probably in 2018, or 2019. I think it is too early to say for our product line. Lastly, considering the various projects that have been announced, how long do you think that this period of growth and the positivity surrounding it would continue? If you see, most of the investments that we did here in the country was during the downturn. So, in that sense, we are quite bullish about India over the long term. Over the short term, we may have a spurt in demand like what we are seeing currently. That may go down. But, in the long term, we feel that there is enough infrastructure to be built in India, and if we have to reach the levels of China, I see a demand for the next 20 years. There will be ups and downs. But, the growth will continue. - Ramesh Palagiri, MD & CEO, Wirtgen India Pvt. Ltd.